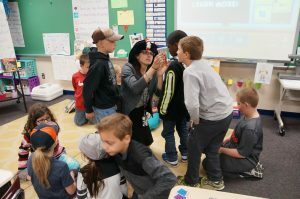 You might think visiting the second-grade classroom of a second-year teacher in the middle of a science lesson—at the end of the day near the end of the school year, no less—would be a bit chaotic. But if you’re talking about Kristen Murcott of C.H. Bird Elementary in Sun Prairie, that would be wrong. Murcott, casually wearing a velvet hat adorned with the Cat In the Hat, easily directed the attention of 18 active, vastly different personalities through several short videos, examinations of jarred insect specimens, and writing in their notebooks. During the first year for new educators, the mentoring focus is on analyzing student work, with pre- and post-assessment of lessons. Murcott talked to the first-year teachers about her experience with that last year. Rosin video-taped her presentation to upload as an artifact for Murcott’s Educator Effectiveness. 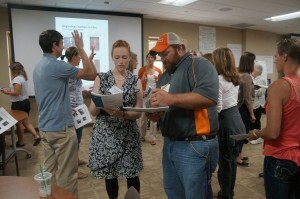 Beginning teachers are also given four days to go anywhere, a new peer observation program started by the principal. Murcott chose to visit a different second-grade classroom, and a first-grade classroom. They are also allowed hours to observe veterans.